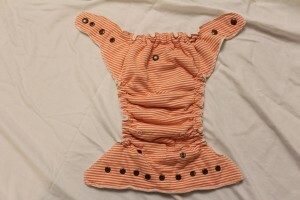 My most recent sewing project was serging my first fitted diaper. A serger is a very cool sewing machine that sews and cuts at the same time. Theoretically, it’s a lot faster and it’s also better for sewing knits (stretchy fabrics). It wasn’t so much faster for me, but that has more to do with my developing serging skills and less to do with the technique. 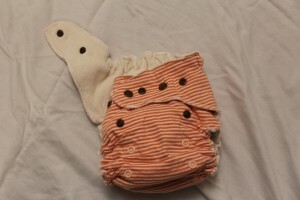 To make this diaper, I used the free one-size Rita’s Rump Pocket Pattern. I pretty much followed this fitted tutorial from Sew a Straight Line, except that I did a cased elastic using the tutorial in this Cafe Mom thread. I tend not to like tacked down elastic, mainly because I feel like all that stretching and pulling while sewing makes my machine go a little wonky. I used the snap & elastic templates from Sew a Straight Line, except that the scale is a bit off on those templates, so I really just ended up using them as a guideline. 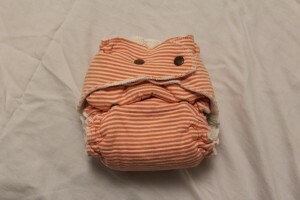 This is probably the least “good” diaper I’ve made, at least recently, but it works and seems to have held up so far. The pattern has been well-reviewed in the past, but I found the wings were too narrowly curved to serge well. Granted, I’m still a very novice serger, but I still need to find a better pattern to practice on. The idea is that you should be able to serge in one continuous “seam” around the entire diaper, but I found I had to sew on and off MANY times (mostly because of my lack of skills). This makes for lots of loose ends and could cause an issue with unraveling over time. Aesthetically, I don’t love the look of the wings on this diaper. It’s tricky to serge next to cased elastic. I tacked one end down too close to the serged side and ended up cutting my elastic there. I had to go back and re-tack it, which actually turned out better, as the leg hole was a little loose with the longer elastic. 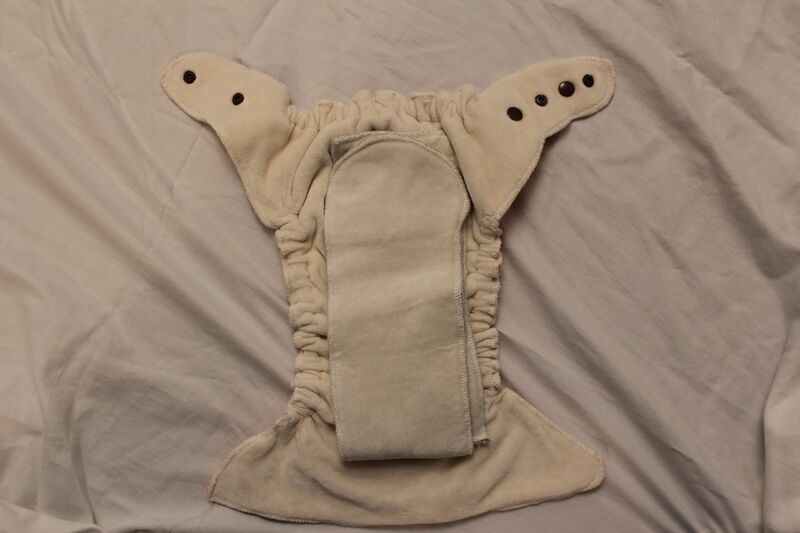 The snap/elastic template not being to scale may have cause some issues with how closely my diaper resembled those in the tutorials. I kind of faked most of it, and it mostly turned out OK, but it would have been nice to have a good template to go off of. I didn’t have a soaker pattern to go off of (Sew a Straight Line had one, but I didn’t know how to modify it, given the scale issues). I just made a long snake style soaker to snap in, but forgot that I didn’t want the snap to touch Emmie’s bum, so the end result works, but looks a little funky. I also made a little mini booster (a al Old School Cool) because my fitteds in the past have all needed a booster to prevent immediate soaking. I need to add another snap on the wing because she was getting some serious wing droop. I actually managed cased elastic! and serging! None of it’s pretty, but it’s there! 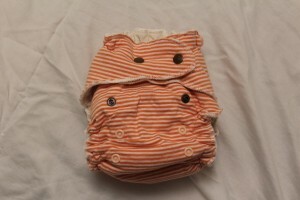 This was also my first diaper with rise snaps, and they appear to work well! So far, it seems functional. 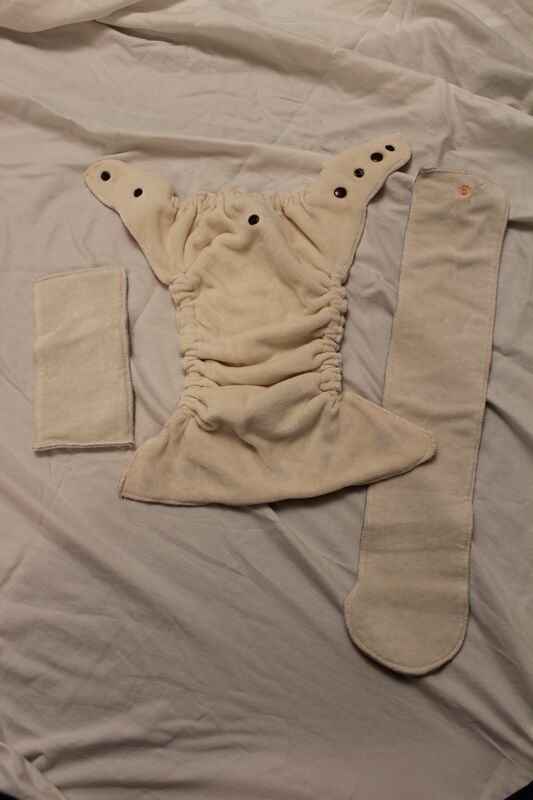 Emmie has only worn it once, during the day, but I think it might be able to work as a nighttime diaper with a few more washes (and some hemp as a backup!). I think my material combination was a bit better this time. Before, I was using a thin bamboo terry in the fitted body (as the hidden layer) and in the soaker. It just wasn’t thick enough to absorb anything. This time, I used a knit outer, OBV inner and bamboo fleece (regular, I don’t have any heavy yet) as the hidden layer. 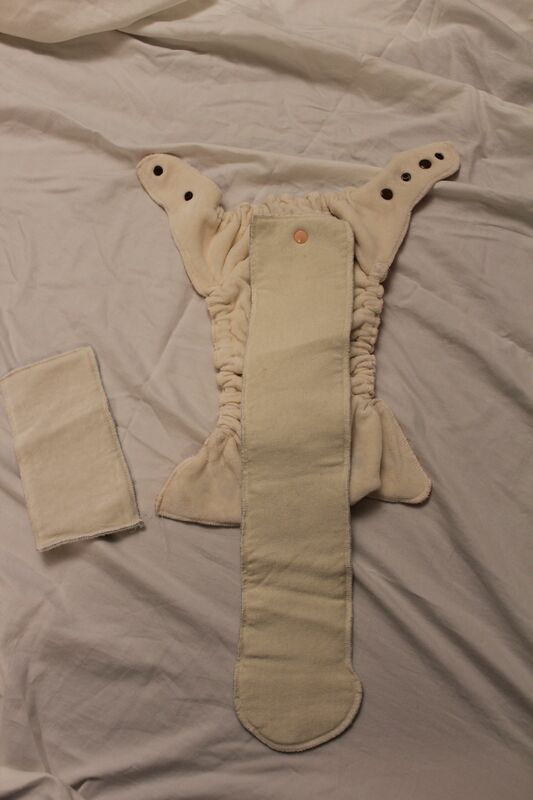 For the soakers, I used bamboo fleece, cotton sherpa in the middle and OBV on top. The sherpa is nice and thick and I think it absorbs pretty well. Snapped diaper with the rise snaps all the way snapped. For reference, Emmie wears other OS diapers (BG, etc.) on the middle rise snap, but these ones are fully snapped. So theoretically, she could wear these for a LONG time! Rise snaps all unsnapped (I did them in peach because I didn’t have a ton of brown snaps). Cross over snaps (definitely needed, Emmie has a very skinny waist). I need to add another snap to the left wing here (only has two, needs 3). Inside with all soakers folded up. 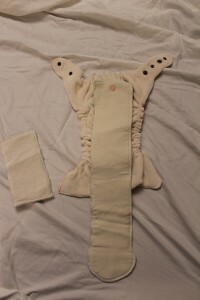 Unfolded snap in soaker (bamboo fleece facing up now). From the back. I don’t like how narrow the wings are in comparison to the body. OK, that’s it! Hopefully this is helpful for some of you out there, and maybe you can learn from my (many) mistakes!